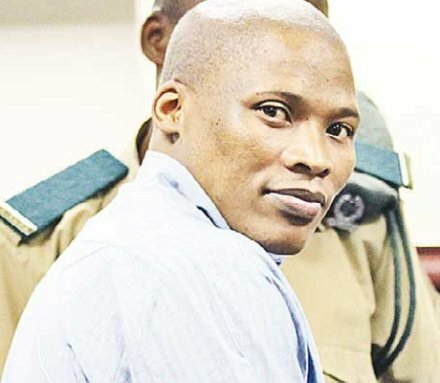 Orelesitse Thokamolelo caught six death sentences in Botswana for slaughtering six family members, and on this date in 2013 he suffered the first of them at Gaborone Central Prison. It all started on a nice visit he paid to his brother Landane Thokamolelo. The Botswana Gazette reported (May 29, 2013) that “on the second day of his visit, Thokamolelo woke up and demanded to cook food where upon [sic] his brother’s wife and mother-in-law refused.” Whether this was the women’s exacting spirit of hospitality or their fear for the state of the kitchen, their houseguest didn’t appreciate the denial. In the ensuing argument, he “took a knobkerrie and beat his brother’s mother-in-law and his brother’s wife to death.” In for a penny, in for a pound, Thokamolelo then turned the bloodied club on the wife’s four-month-old child. The brother during all this was out collecting firewood with two other children, and when they returned later that day, Thokamolelo served them the same way, albeit with fresh bludgeons: the brother he overpowered and battered to death with a hammer, after which he pursued the fleeing children into the bush and “killed them with a log.” The doggedness and calculation implied in murdering the second trio must have weighed heavily against Thokamolelo’s attorney’s attempt to float an insanity argument. Not even reefer drives a man that crazy: “After anxious inquiring of mind of this matter, I also find no misdirection by the trial court in considering the effect of dagga taken by the appellant and giving it weight,” an appellate judge ruled in April 2013. Botswana is not a particularly frequent user of the death penalty, with a single-digit death row and hangings typically separated by several years. (Its most recent was Patrick Gabaankanye, just a few days ago as of this writing.) That small sample, however, holds some uncommonly interesting cases — such as Mariette Bosch and Modise Mokwadi Fly.